You are here: Home / Electronics / What is the Best Electric Shaker Cup? When my friend walked into the room after our work out holding his protein drink, I didn’t think much of it. I continued to watch TV while sipping on my own concoction of post-workout goodness. Suddenly, I heard a “check this out” coming from his direction. He held the cup in front of my face and what I thought was merely another shaker cup filled with a protein mix was actually swirling inside of the bottle! I’ll be honest and say that I’ve never heard of such thing before. I’ve always been a bit wary of shaker cups because my experience has always been having to scrape the extra protein powder out of the bottle that gets stuck to the bottom, let alone the putrid smell that builds up with time. But alas, my life has forever changed since I’ve been introduced to electric shaker cups. Intrigued, I set out to find the best one on the market. Here’s what I found. What are Electric Shaker Bottles? We all know the beloved shaker bottles seen around gyms across the world. They have that wired ball that is apparently there to help mix your drink. Sometimes you’ve got the pre-workout fanatic sipping their mix on the bench before partaking in their exercise regimen. Next we may see the intra-workout junkie sipping their neon pink BCAA stew while they curl. Then you have what most people use the shaker bottles for, mixing the essential post-workout ingredients to optimize our workouts accordingly. 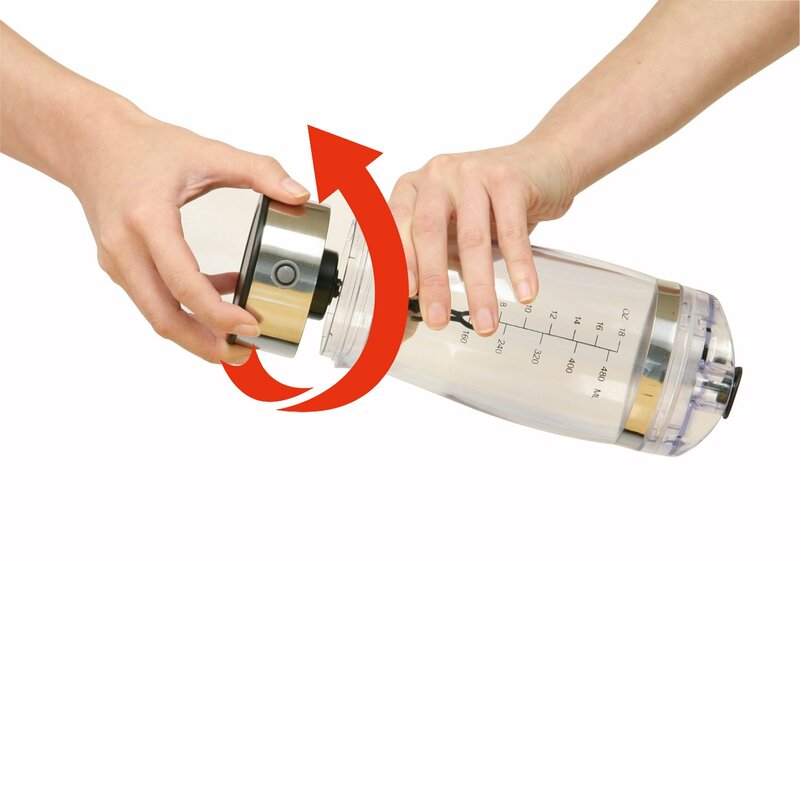 Electric shaker bottles do basically what the name implies: most create a funnel within the bottom of the cup to slowly (and relatively evenly) mix your ingredients to form the perfect shake. The cup continues to do so while you drink it unless you turn it off. No more hassling with those metal balls that collect goop of protein chunks in and around the bottle. This is a relatively fresh product but many fitness companies are beginning to enter the market. What is the Best Electric Shaker Bottle/Cup? As a new little trend rising slowly in the fitness industry, there are only a handful of cups out there that can compete in terms of electric mixing. We weren’t concerned with blenders, but more or so the portable shaker bottles we can use for on-the-go purposes. They’re all mostly affordable. Here’s what we found. This mixer cup has been rated relatively high on the net. Takes AAA batteries and works effectively, mixing mostly any liquid such as milk with protein powder. At only 12$ retail, it beats spending half of that for a mere plastic bottle you have to shake yourself. Some cons can include some people complaining about not having enough ‘power’. Considering this thing is budget-friendly and is made for protein\supplement drinks, don’t expect to mix bananas or other fruits in there. It isn’t a blender. It’s a shaker cup. This electric shaker bottle is BPA free, stainless steel and is said to be able to handle all liquids, including eggs. The motor is expalined to be at 11,000 rpm and requires 2 AAA batteries. Word on the street is that this bottle simply does it’s job. Stated to work with everything such as lemonade, coffee, kool aid, etc, the motor is up to par in terms of enough power to function properly. Make sure to add your liquid first, then your powder. Does it’s job. Some cons include customers complaining about clumps of protein still gathering within the bottle. Just make sure you don’t overload it with tons of scoops and you should be fine. The iTouchless LCM02S is dishwasher safe with a removable container. The base has a non-slip component and an anti-spill lid. Clear acrylic tumbler can handle both hot and cold liquids. Takes 2 AA batteries and holds 20 ounces. Although it’s a little higher in price, the cleanup is a lot more convenient than the other bottles listed. In our opinion, cleaning is one of the biggest factors with these types of products. It’s not going to crush ice or blend fruit smoothies – it’s a portable shaker cup, not a countertop belder. All of these electric blender bottles work as intended; however, you came here for an answer and we’ll give it to you: which one is the best? We’ve received the best responses with the bottle above, the iTouchless LMC02S. Although it is the most expensive of the bottles, it is well worth the money because of a few things: it works as intended, holds an above-standard amount of shake, and most importantly, is easy to clean! You’re already getting a shaker cup for on-the-go which means you’re a busy person the least. Therefore, cleaning this thing the night you get home should be as convenient as possible. We’d go with the iTouchless. What is the Best Protein Nutrition Bar?